Carly and Felix demand to know who’s in Franco’s room. He’s forced to admit he has a lady friend waiting for him. Carly is angry, but claims she doesn’t care. She insists Franco pay for his room after all. Shawn tells Sonny that Vince’s boss is Julian Jerome. Sonny points out Julian is dead and long gone. Shawn admits he let Vince go. Sonny screams at him until Olivia walks in and stops it. Julian gloats that with his new face and ID, there is no record linking Derek Wells to Julian Jerome. He’s ready to take over Sonny’s territory and is making plans to grab one of Sonny’s shipments. Ava tells him about the party for the kids and how it will keep Sonny occupied. Julian is angry Ava didn’t heed his warning to stay away from Sonny. Alexis wonders what Sam and Silas are whispering about. Silas admits he asked Sam out for dinner. He understands Alexis didn’t like him in the beginning and apologizes for saying what he did about Sam’s mothering skills in court. Sam accepts the apology and wonders if this is about Kiki. Kiki tells Morgan they’re being evicted from the boathouse, since she isn’t a Quartermaine. Morgan tells her to reach out to Silas and see if he can help them. Kiki hasn’t seen Silas since they found out he was her father and doesn’t feel comfortable reaching out. Sonny mentions to Olivia that Julian Jerome can’t possibly be the head of anything. She points out Ava and Kiki share the same name. Sonny says there is no link and speaks highly of Ava, which annoys Olivia. Ava simply wanted to plan a party for the kids, Sonny persists. Olivia reminds him Connie’s funeral is the next day, Plus, he should focus on their new granddaughter. Sonny feels they need some joy. He wants to celebrate for Morgan. Before she leaves, Olivia warns him to take his meds. Ava is angry at Julian’s strongarm tactics with her. She reminds him they are equals. She’s the one who pushed Morgan and Kiki together and made sure they got married. She assures Julian her party will keep everyone occupied, while he makes his move. Alexis asks Sam about the date with Silas. Sam says she’s lonely since Jason’s been gone more than a year. She insists it’s only dinner. Alexis understands Sam is an adult, but she will continue to watch out for her. Sam asks her about Derek. Will Alexis give him a chance? Franco tells Heather she ruined his life. Carly, whom he cares for, now thinks he&apos;s sleeping with someone, because he had to lie to cover for Heather. Heather warns him Carly is dangerous. Franco is hoping for a normal life, but he’ll never get Carly to love him. Before she leaves, Heather promises he’ll find someone better than Carly. Carly and Felix spot Ava and Julian on the docks. Julian reminds Ava to run everything by him. Ava tells him Sonny is grief stricken and off his meds. Julian figures this is the opening they need. After Ava leaves, Felix makes a noise. Julian is about to draw his weapon and see who&apos;s there. Carly pretends she and Felix are fighting and they didn’t notice him. After the encounter, Felix tells Carly maybe Derek can help her forget about Franco. Silas stops by to see Kiki. He says he hasn’t been by before because he was concentrating on Danny’s care. Now he’s reaching out and saying hello. Silas wants them to get to know each other. Ava arrives and is unnerved to see Silas. She informs Kiki of her party planning with Sonny. Kiki accuses her of putting on a show. Ava says Sonny is okay with the party and Morgan wants Kiki to agree. Kiki agrees, but only if she can invite Silas. 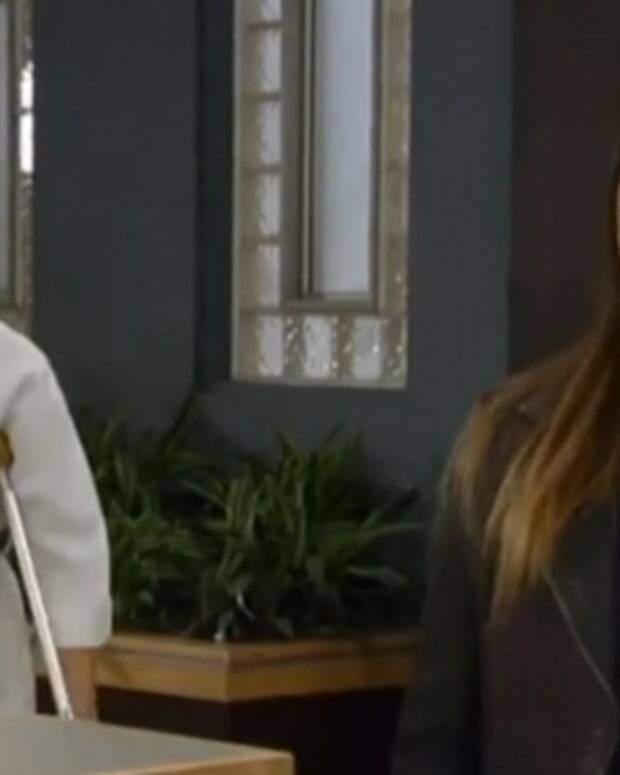 Perkie's Observations: Carly TEARS Into Robin on General Hospital!